Where Can I See Sing-a-Long-a Frozen in the UK? Disney's Frozen has become the highest grossing animated film in history and a huge part of that success is due to the popularity of the songs. So now a show is offering fans of the musical, from children to gaggles of hen parties, the chance to let their inhibitions go and join in all the fun and music of the hit movie at a singalong event. Audiences even get to dress up as their favourite characters from the Disney musical, whether it's a snow queen, Sven the reindeer or Olaf, the lovable snowman. A UK tour of the Sing A-Long A Frozen show takes in Birmingham, Liverpool, Oxford and other major towns from March to October. Recommended for any child aged five or over, the screening shows the film complete with lyrics to accompany songs during Anna's search for her sister Elsa, the Snow Queen, in order to put an end to her icy spell. There's also a live host to help warm up the proceedings, which last for 2 hours and 40 minutes. Songs include Do You Want To Build A Snowman, Love Is An Open Door, In Summer, and the most famous song of all, Let It Go. 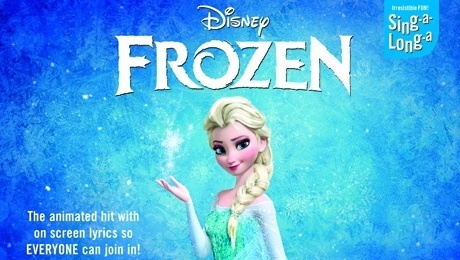 Frozen has not just won the popularity vote, it also clinched two Academy Awards for Best Animated Feature and Best Original Song with Let It Go, sung by Idina Menzel. The film also win the Golden Globe Award for Best Animated Feature Film and the BAFTA Award for Best Animated Film. Tickets cost £16.90 from the ATG theatre ticket website.